As you likely know, the Dodge Durango is a popular mid-size SUV. There are many trim levels available, but many people are drawn to the SXT, R/T and SRT models, which are the base, mid-ranked and high-end models, respectively. The SXT comes with a 3.6-liter V-6 engine that's equipped to an 8-speed automatic transmission. Get a little more power with the R/T, featuring a 5.7-liter V-8 engine attached to an 8-speed automatic transmission with fuel saver technology. 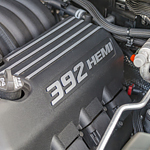 Finally, the SRT offers massive power, as it contains a 6.4-liter HEMI V-8 engine, and it has the same transmission as the R/T. A performance-tuned all-wheel drive transmission is attached to the SRT, helping it handle the high amount of horsepower and torque. While this is a quick overview of three models, Dodge offers two other trim levels with varying features. Plus, the SXT, R/T and SRT trim levels have many other differences, such as their exterior and interior features.